In this article, We have gathered a lot of resources that can prove to be very helpful for all who want to become Android developer, even if you are a beginner or an experienced developer. It is an endeavor to reduce your depression and assist you in getting access the best resources to master in android development. 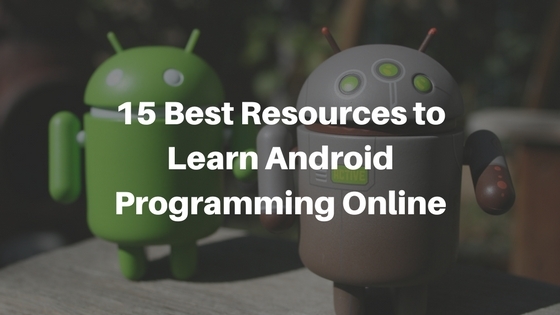 So whether you are new to mobile app development or looking to learn Android development, here is a list of the 15 best resources to learn android programming online. Developer.android.com is one of the best sites to learn android app development. It is the most up-to-date resource you have to access, and it is Android’s own website. One of the lesser-known features that it covers is a full how-to with practices on Android app development. It is the official Android development page offered by Google. It contains all the documentation you’ll require, and there is also a training segment that will teach you android programming step by step. If you are interested in those topics, there are also guides and documentation for design and distribution. Vogella is stuffed with in-depth tutorials on some of the more advanced concepts in Android development. It has an extensive collection of free Android tutorials that touch on everything from the basics to advanced topics. Vogella is an excellent resource to learn android programming because it is free but will readily accept your donations. The tutorials here are sufficiently simple to follow and include a lot of screenshots and code snippets. Every tutorial is amazingly well written, presenting excellent code examples and links to more resources. My Life with Android is a blog, which is more similar to a developer’s diary than whatever else. It is running by Gabor Pellar, and it describes his experience with Android development. While it is an incredible resource, it might contain errors as it is written by somebody who is putting down his musings as he learns Android development. However, it is a great resource to learn android programming and you should able to learn something by understanding another person’s experience with Android development. Technotalkative is one of the best websites to learn android app development. This site is running by Paresh Mayani. He has collected each article and tutorials. He has created for Android all in one spot. The tutorials are mainly cover aspects of Android app development and aim to provide in-depth answers to specific questions. The tutorials will be available free. The New Boston is one of the best sites to learn android app development. If you want the tutorials in a video format? You can try The New Boston. It has a collection of 200 video tutorials for Android app development. It is the best way to learn android development. After watching these enormous tutorial collections, you should be able to implement your idea in Android development. The Android Bootcamp is a free video series filmed live while Marakana’s Android Bootcamp Sessions. It’s also has a complimentary slideshow included with the video series. These tutorials will guide you through all that you have to know about Android development. It is one of the best resources to learn android app development. It also covers all topics in android development. For example, security, content providers, and system services. Treehouse is the best resource to learn android programming. It is a subscription-based site with an extraordinary collection of tutorials and lessons that will guide you through Android application development from the basics to advanced concepts. Subscribing to their services gives you access to the all of their courses which you can finish at your own convenience and pace. Lynda.com also the best site to learn android programming online. It is another subscription-based site which has excellent tutorials for each different topics, including mobile application development with Android. You will locate a numerous collection of video tutorials, and you can download and learn at your own pace. Every course is high quality and gives all the files and resources you have to finish the tasks. MobileTuts+ is an incredible resource to learn android app development. As a portion of the prolific Envato network, they convey a part of the best content about mobile app development available on the internet. Regardless of whether you are a skilled developer or a beginner, Mobile Tuts+ has a vast collection of free tutorials on Android development. Coursera is one of the best resources to learn android app development. Coursera is unique in that real college professors guide its courses. It manages to offer real college classes online for free. The training classes have starting and end dates, but can be begun whenever while the course is being offered. First, it will lead you through the primary material, and then it will move on to Android specific lessons utilizing Java and standard software development tools. You don’t need any prior coding knowledge to begin. Coursera classes comprise of recorded lectures, interactive knowledge checks, tests, and quizzes. Students will get a certificate of course completion at the end of the training course. Udacity is one of the best websites to learn android app development online. It is another online coding school for programmers. But their Android development course was really established by Google. In this course, you can keep learning more in-depth concepts in regarding Android development. It is an incredible resource to learn android programming for beginners to intermediate programmers. AndroidHive is the best site learn android programming online. This website is maintained by Ravi Tamada. He is another prestigious Android developer. Several posts are step-by-step guides on working with Android development tools. He describes some particular functions that you can practice with your own projects. Made in Android also the best resource to learn android app development. It is another blog or online publication that gives a wide variety of Android application development tips, tricks, and guides. It’s extraordinary for all skill levels, particularly in case you’re looking for help with something particular like making a custom listview in your application with a search box or making a Google Map enabled the app. Codelearn is one of the best websites to learn android development online. It specializes in a unique form of teaching. Codelearn lessons will teach you how to build Android applications with different programming languages. Codelearn has newly launched an Android-centric portal which is more than helpful. Android Example is the best resource to learn android online. If you want to know how to handle some of the more advanced features and functions in android? Android Example is a great choice for you. It is mainly focused on the niche topics. You will learn android programming step-by-step with utilizing SharedPreferences, opening the file browser with the camera application and much more. Whether you are learning Android app development for fun or adding it to your collection of skills, these online resources are an excellent starting point. We hope these resources will assist you to learn more about Android development and build better Android apps. Have we missed any other useful resources? Let us know in the comments. Zuan Education Launches its New Android App!